Have you ever tried making lasagna using paper-thin slices of potato instead of pasta? It's a genius remake of traditional Italian lasagna. The potatoes have the same chewy starchiness you get with pasta noodles. Add meat for the carnivores or take it vegetarian as I've done here with kale and pesto sauce. 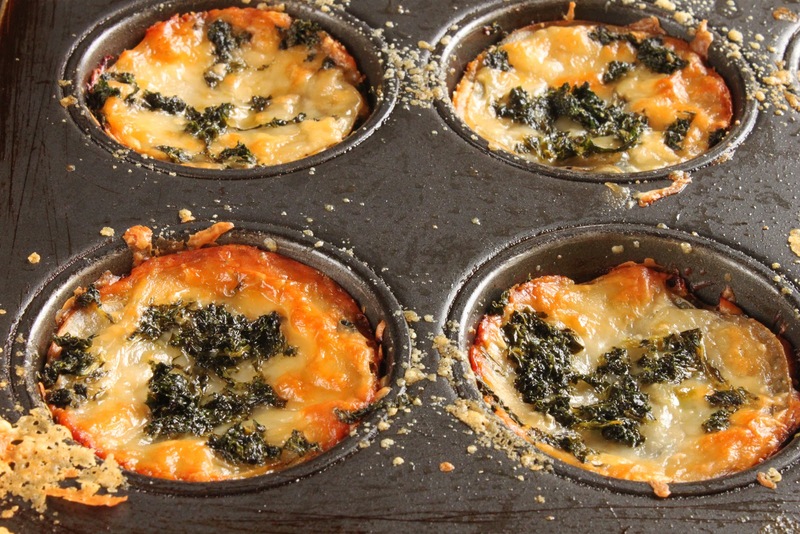 You can make this recipe as one big lasagna, but I prefer making mini lasagnas in a muffin tin instead. Portion control - it's a good thing. Note: This recipe was originally published on the Idaho® Potato Commission website. Go look at their amazing collection of potato recipes - I guarantee you will be inspired. Individual mini lasagnas using thinly sliced potatoes instead of pasta. 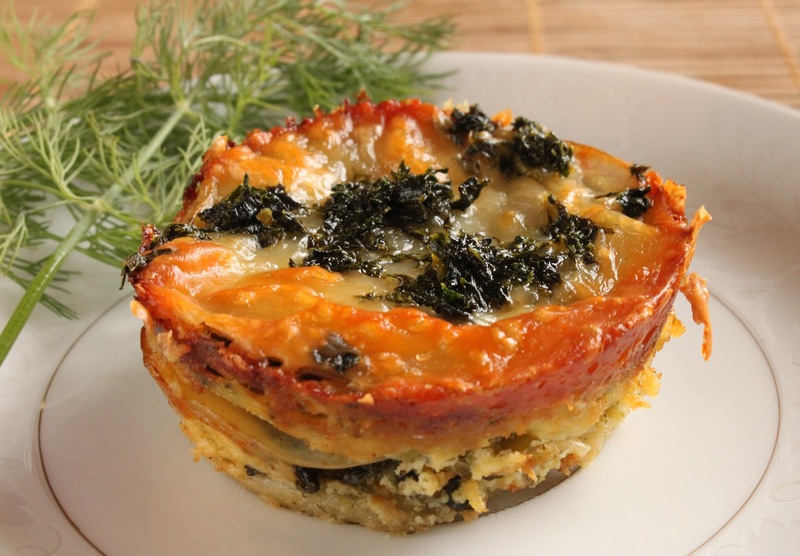 Kale and pesto make these single-serving lasagnas a delicious gluten-free vegetarian entree. Wash the kale well and strip the leaves from the stems (discard the stems). Chop the leaves finely. It’s okay if some water clings to the kale leaves.Heat the olive oil in a large skillet over medium-high heat. Add the garlic and kale and saute about 5 minutes, until the kale is wilted. Remove the skillet from the heat and set aside.Slice the potatoes paper-thin. (It’s easiest to do this with a mandoline, v-slicer or food processor.) Toss the potato slices with the salt and let sit about 5 minutes.In a small bowl, mix the ricotta cheese, pesto sauce and egg together.Preheat the oven to 350° F.Assemble the mini lasagnas: Spray each cup of the muffin pan with nonstick cooking spray, or brush it with olive oil. 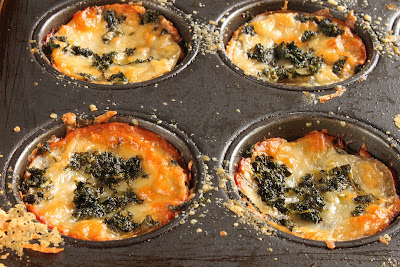 Build the lasagnas in layers in each muffin cup, starting with a layer of potato slices, then adding a small dollop of the ricotta-pesto mixture, a teaspoon of cooked kale, a sprinkle of shredded mozzarella cheese, and a sprinkle of grated parmesan or Romano cheese. Continue building the mini lasagnas in this manner, finishing each one with a layer of potato slices and a sprinkle of mozzarella and parmesan.Bake the mini lasagnas about 40 minutes, until the potatoes are tender, the cheese is golden brown and the lasagnas are cooked through. Remove from the oven and let sit 5 minutes before attempting to remove from the pan. Use a small offset spatula or blunt knife to unmold the mini lasagnas and transfer to serving plates. Serve immediately. Do you think these would freeze? I could see popping one of these mini lasagnas in the microwave for a quick and tasty lunch. How smart to use potatoes instead of pasta! Love the kale in here. 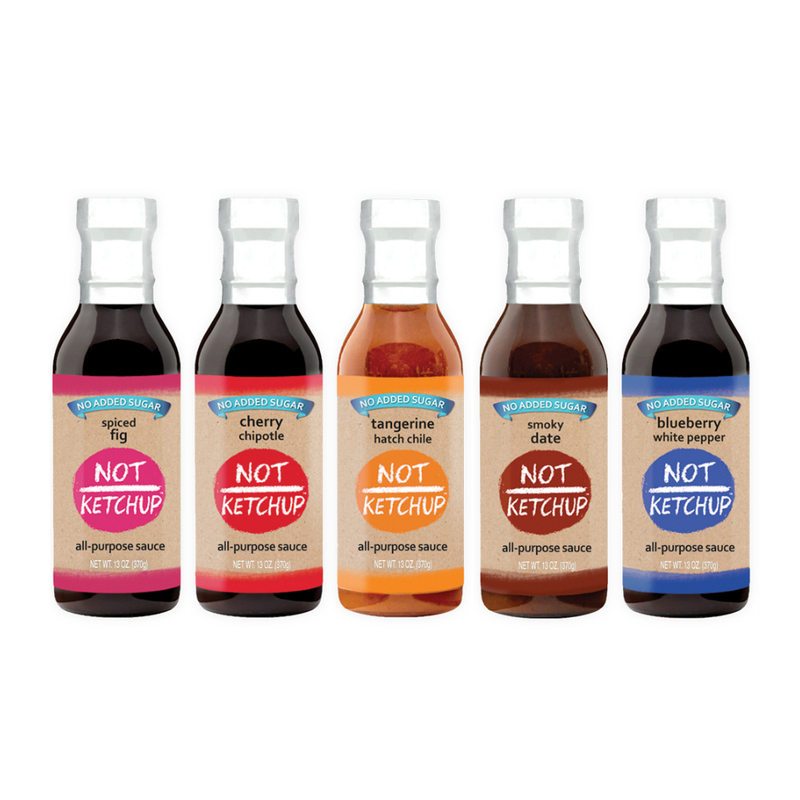 We're going to make these! I made these for dinner tonight and they were delicious. VERY cheesy, and a very nice presentation as well. Will definitely become part of my regular repetoir. I ate this yesterday. It is freaking delicious and my kids love it too!